​Send these, the homeless, tempest-tost to me,"
​The greatest, in the land of the brave and the free. "Muhammad Ali was The Greatest. Period (full stop). If you just asked him, he'd tell you. He'd tell you he was the double greatest; that he'd "handcuffed lightning, thrown thunder into jail." But what made The Champ the greatest -- what truly separated him from everyone else -- is that everyone else would tell you pretty much the same thing. Like everyone else on this planet, Michelle and I mourn his passing. But we're also grateful to God for how fortunate we are to have known him, if just for a while; for how fortunate we all are that The Greatest chose to grace our time. In my private study, just off the Oval Office, I keep a pair of his gloves on display, just under that iconic photograph of him -- the young champ, just 22 years old, roaring like a lion over a fallen Sonny Liston. 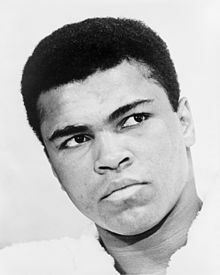 I was too young when it was taken to understand who he was -- still Cassius Clay, already an Olympic Gold Medal winner, yet to set out on a spiritual journey that would lead him to his Muslim faith, exile him at the peak of his power, and set the stage for his return to greatness with a name as familiar to the downtrodden in the slums of Southeast Asia, and the villages of Africa, as it was to cheering crowds in Madison Square Garden. "I am America," he once declared. "I am the part you won't recognize. But get used to me -- black, confident, cocky; my name, not yours; my religion, not yours; my goals, my own. Get used to me." That's the Ali I came to know as I came of age -- not just as skilled a poet on the mic as he was a fighter in the ring, but a man who fought for what was right. A man who fought for us. He stood with King and Mandela; stood up when it was hard; spoke out when others wouldn't. His fight outside the ring would cost him his title and his public standing. It would earn him enemies on the left and the right, make him reviled, and nearly send him to jail. But Ali stood his ground. And his victory helped us get used to the America we recognize today. He wasn't perfect, of course. For all his magic in the ring, he could be careless with his words, and full of contradictions as his faith evolved. But his wonderful, infectious, even innocent spirit ultimately won him more fans than foes -- maybe because in him, we hoped to see something of ourselves. Later, as his physical powers ebbed, he became an even more powerful force for peace and reconciliation around the world. We saw a man who said he was so mean he'd make medicine sick, reveal a soft spot visiting children with illness and disability around the world, telling them they, too, could become the greatest. We watched a hero light a torch, and fight his greatest fight of all on the world stage once again; a battle against the disease that ravaged his body, but couldn't take the spark from his eyes. Muhammad Ali shook up the world. And, the world is better for it. We are all better for it. Michelle and I send our deepest condolences to his family, and we pray that the greatest fighter of them all finally rests in peace." Click on image and obtain your copy today! and join the discussion about our future. The Ultimate Vanishing Act is a rare piece of historical narrative literature as well as a timely contribution to world security. The book chronicles a history as important to the people of the United States as it is to Canadians, Europeans, and those who reside in an increasingly troubled Middle East, Africa, and Central, South, or Southeast Asia. The Ultimate Vanishing Act provides an eye-opening account of current world events, how decisions made in the past have shaped the present, and how those we make today influence the forces that will propel us into the future. The author's ultimate achievement lies in the way he connects important historical events with contemporary problems and issues. The Ultimate Vanishing Act is not only a transformative experience for those who have read it—it is an urgent call for a major change in the course and direction of current political discourse. One might consider the sharp contrast between the inclusive and hopeful nature of the politics of Justin Trudeau and Barack Obama and the division-ridden politics of fear articulated by Donald Trump or Stephen Harper. And yet, part of the transformative message of The Ultimate Vanishing Act is a reminder that within constitutional republics such as Canada and the United States, political adversaries (those with whom we disagree), no matter how challenging and troublesome they are at times, are not our enemies, nor are they enemies of the state; they are our partners in a noble constitutional republican experience. Eric LaMont Gregory, MSc (Oxford), received his master's degree from the prestigious Faculty Board of Clinical Medicine, Green College, Oxford University. The author is an international diplomat, as well as a world-class medical scientist, credited with unraveling the intricacies of blood flow in the subcutaneous fatty tissue of critically ill preterm newborn babies. Eric LaMont Gregory will be a candidate for President of the United States in 2020, running on a platform to build an America that is not only secure geopolitically, but in which personal liberty and economic security are realities for all.